Between Series Two and Series Three, the production team decided to tackle Christie's first ever Poirot novel, The Mysterious Affair at Styles, published in 1920, to coincide with the centenary of her birth in September 1990. The screenplay was written by the excellent Clive Exton and the director was Ross Devenish. Considering the length and complexity of this story, the script stays remarkably true to its source material. A few characters are omitted (Dr Bauerstein, who was merely a subplot or red herring really, and the maid Annie) and certain passages are removed (the extra coffee cup Lawrence is searching for, the letter to Evie from Mrs. Inglethorpe, the visit to the hospital where Cynthia works, the gardeners who witnessed the will etc.). Some passages are shortened down, such as Poirot's initial interviews with the household and the trial of John Cavendish, but the key information is kept intact. Some elements are added, such as the scenes with the group of Belgian refugees Poirot is educating, as well as Hastings's war trauma memories, and the important and explanatory visit to the Institute of Pharmacology. All in all, however, the script is faithful to the novel, probably as faithful as an adaptation can possibly be without recounting every single word. Ross Devenish's direction is very competent. 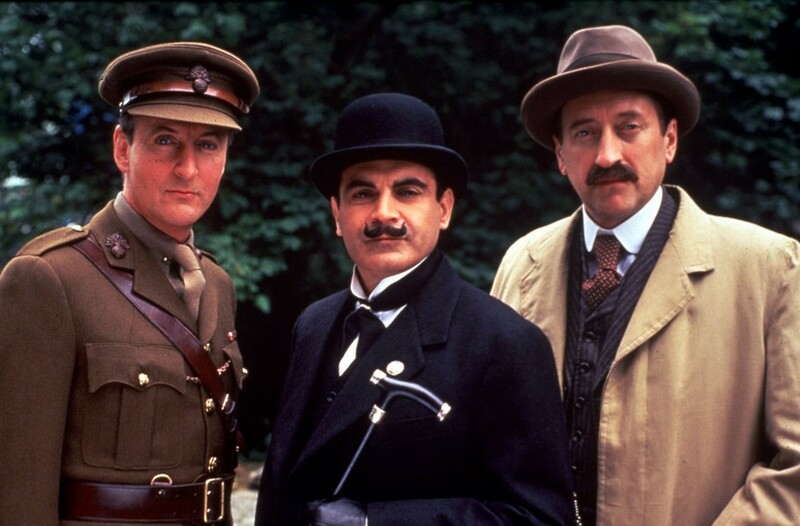 I particularly enjoyed the way Poirot was introduced on screen, with a close up on his patent leather boots, then moving up his legs to his face - very reminiscent of the first shot of Poirot in the first-ever episode, The Adventure of the Clapham Cook, directed by Edward Bennett. A nice touch! As to the production design, it is wonderful to note the attention to detail in recreating wartime Britain, from the streets of London to the village of Styles St. Mary. The locations for the episode include the beautiful Chavenage House, near Tetbury in Gloucestershire, used as 'Styles Court', a location I sincerely hope they've returned to for the adaptation of Curtain!, as well as the village of Easton Grey, Gloucestershire, doubling as 'Styles St. Mary', and the end scene shot in Lloyd Square, London. See here, here and here for photos. Several pieces from the soundtrack are included on Christopher Gunning's latest CD release, including 'War' (from the opening scene), 'A Country Retreat' (from Hastings's arrival in Styles St. Mary) and 'The Death of Mrs Inglethorpe' (from the death scene, obviously). It's lovely to see David Suchet transform into the younger Poirot, complete with a hair-piece to make him look younger (they would use the same trick for one later episode, The Chocolate Box), supporting my theory that the television version of Poirot was significantly younger than the book version of Poirot when he arrived in England (see my chronology blog). Suchet gets to display 'the tools of Poirot's profession', a set of objects we will rarely (if ever) see used again in the subsequent episodes. You should also note the added scenes in which Poirot's attention to order and method (e.g. the reordering of the post office groceries, the complaint on the English countryside as opposed to the streets of New York). And of course, there's the famous scenes from the book, i.e. the reordering of the mantelpiece and the building of cards to focus his little grey cells (which we'll see again in later episodes, e.g. The Disappearance of Mr. Davenheim and Three Act Tragedy). As to Hastings, I'm intrigued by the addition of the war trauma (particularly well executed by director Devenish). It adds a depth to Hastings's character which we rarely see. Perhaps one of his final two appearances in the series, The Big Four, apparently set just before the break of the Second World War, and Curtain, set almost immediately after it, will make a reference to his experience of war? That would certainly be an interesting addition. Also, I notice that a) any references to Hastings's previous employment at Lloyds and b) any references to specific years in which Japp and Poirot have collaborated before are excluded in the adaptation. For once, they choose to be vague on facts and character history, and I think it's a wise move. As to the guest performances, one can clearly see that the actors have so much more to play with in these longer stories. But for me, the standouts are certainly Michael Cronin (Albert Inglethorpe) and Joanna McCallum (Evie Howard), the first managing to convey just the right amount of uneasiness and creepiness, and the latter accurately portraying the character from the book. For me, the adaptation glosses over the double jeopardy angle too much. In the book, Poirot realises what the killers' plan is and doesn't want Inglethorpe arrested until he has all the evidence; he also wants John arrested to bring he and his wife closer together again. All of this is missed on TV, so it just looks like Poirot wrongly thought Inglethorpe was innocent, and it turns out that the murderer was exactly who we thought it was all along.